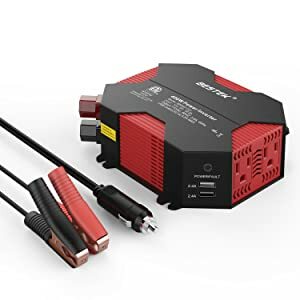 2 What is a Power Inverter for Car? 3 Why You Need a Power Inverter? A power inverter is one of the most important devices in a car. It has the primary function of converting low-voltage direct current power to standard household alternating current power. This means that with the power that is produced by a car, you will be able to operate and charge common household appliances and gadgets like your smartphone. 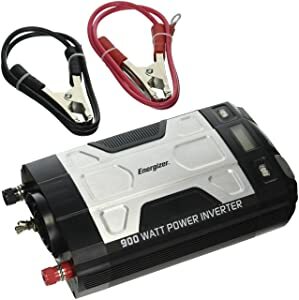 In this guide, I will list down some of the top choices for the best power inverter for car. You will be overwhelmed with the multiplicity of the options that are available, but this does not mean that you can pick just any product. I hope that this post will help you to come up with a well-informed decision. Here are some of the products that should be part of your list, as well as some of the notable features that make them worth the spending. To add, I will also list down some of their pros and cons to make it easier for you to evaluate the possibilities. Considered as the world’s smallest power inverter, this is one option that should definitely be on the top of the list. As the company claims, it took them five years to research and develop the product. One of the best things about this product is that it comes in a complete package, which allows it to provide the best value for money. Wired remote control, fuse kit, and battery cables, among others, are already included in the box. In terms of power, this unit can produce 4,000-watt of continuous power. On the other hand, at its peak, it can deliver up to 8,000 watts. The input voltage is 12V DC. Meanwhile, the output voltage is from 110 to 120 volts. For your safety and peace of mind, this power inverter is packed with features that will take away all your worries. For instance, it has protection from overloading and short circuit. All of these features have been tested by MetLab, which ensures its optimal performance. Nonetheless, there are also apparent drawbacks to this product. For instance, there are some reports of smoking and burning. This can be prevented if you pay attention to proper installation and if it is used only within its capacity. 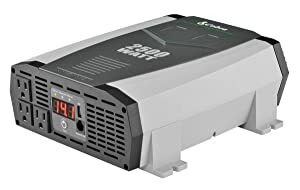 This power inverter delivers 1,100 watts of continuous power and 2,200 watts of peak power. It converts 12-volt DC to 110-volt AC. This power inverter comes with a built-in fan, which is one of the ways by which the unit is cooled as it works. Even with the fan, however, you can expect that it will be quiet as it operates. This is unlike cheaper models that can produce a loud sound. The power inverter comes with a case that is made of anodized aluminum. This material is not only lightweight but also long-lasting. It makes it possible to resist wear and tear caused by external elements. It also comes with three-foot cables that will make it easy to have it connected from the source of power in the hood. The digital LED display is also an exceptional feature that you can find in this power inverter. The latter will provide you with the information that you need to know, such as input voltage and output wattage. If there is one complaint about this model, however, it would be with the power cables, which some people found to be brittle and stiff. This may make it quite difficult to connect it to the battery. Through time, however, the cables become softer. One of the best things about this product is that it comes with 3,000 watts of continuous power and 6,000 watts of surge power. With the latter, you can expect that it will deliver powerful performance that is hard to rival. There are also several innovative design features that you can expect in this product. For instance, it has remote switch, which make sit easy to switch it on and off. There are also LED indications that will make it easy to monitor the functions of the power inverter. For maximum protection, the device comes with protection from high and low voltage, over temperature, and short circuit. Because of these features, the inverter is able to resist external elements that can speed up wear and tear. This is one of the reasons why the high price can be justifiable. Nonetheless, the power of this product can be seen as a two-edged sword. Yes, it means that you can charge more appliances, even those that are demanding in terms of its power requirements. However, this can also be a bad thing. This means that your battery might be drained quicker. This affordable power inverter for car proves that good things can indeed come in small packages. It can provide 300 watts of continuous power and 700 watts of instantaneous power. It is also versatile as it comes with two USB charging ports and two AC outlets. There are many reasons why it is exceptional and one worth noting is the fact that it has multi-protect technology. Some of its innovative features include intelligent protection circuit device and intelligent overload protection. It also has isolation voltage protection to keep your devices safe. The ultra-compact design of the power inverter is another reason for its popularity. It is lightweight and portable, making it easy to be brought anywhere and use it beyond your car. It also has a 24-inch cable, which is long enough for most vehicles. To enhance its performance when charging, it comes with prime double clip design and safe charge protection. It delivers stable current and has a stable clip design that will provide you with peace of mind as you charge your gadgets. There can be some issues about overheating and blown fuses. To prevent this from happening, you should not place it next to a heat-sensitive material. 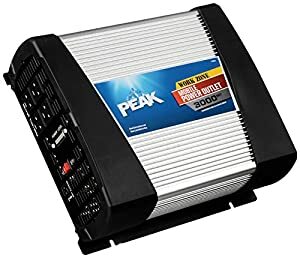 With 2,500 watts of continuous power and 5,000 watts of peak power, this is another great option if you are looking for a high-performing power inverter. It has three AC outlets and has plenty of power that will allow it to run up to three appliances at a time. The unit comes with 5-volt 2.1-amp USB output, which is capable of charging smartphones and tablets, among others with USB connection. To make it easy for you to monitor the power that is produced by the unit, it is also a good thing that it comes with a LED display. This makes it easy to see the voltage and the consumption of the power of the device or appliance that is plugged. The manufacturer has also developed key technologies to deliver top-notch security. It offers protection circuitry that is sure to provide you with peace of mind when using this power inverter. To be specific, it has Pentagon Protection. It offers protection through low voltage alarm, low voltage shutdown, over-voltage shutdown, reverse polarity protection, and thermal shutdown. The solid construction of the power inverter is also a plus. You can expect that it will withstand many years of use. This makes its expensive price justifiable. This power inverter has 12-volt DC power and 1100-volt AC power. The company has made a reputation that is hard to match, which is the reason why a lot of people view this as their favorite brand. In terms of versatility, you can have it connected directly to the battery of your vehicle or you can use cigarette lighter plug. The power inverter comes with four USB ports, making it perfect when you are on the road with your family. It makes it possible to charge multiple gadgets at a time while making sure that it is able to produce more than enough power. However, caution must be observed when you are using this power inverter. It can be prone to blown fuses and can make a smoke because of burning. Be sure to follow all the instructions from the manufacturer about its use, especially its installation. The fuses may have durability issues, but the good thing is that they are replaceable. To combat some of these problems, there is also a fan that will provide the cooling that is needed to prevent burning. A heavy-duty option for a power inverter, this can be directly connected to a 12-volt DC battery. With 900 watts of continuous power and 1,800 watts of peak power, this can be handy for gadgets, consoles, and small appliances. The product comes with a thermal fan, which is also the one that is responsible for providing cooling to the internal components. This is vital to prolonging their functional life. The fan is also great because it operates quietly. Like most of the power inverters for cars, it is also has an LCD display that shows crucial information you have to know about the device. It will let you know the input voltage, output wattage, and battery level. The kit comes with a three-foot battery cable, which will allow you to have it connected directly to the battery as its source of power. To provide users with multiple slots for charging, there are two USB charging ports and two standard AC outlets. Despite the good things, there are some who complained that there is a potential for it to start a fire, so you have to use it with caution. 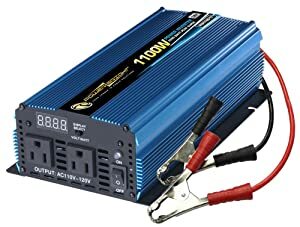 What is a Power Inverter for Car? A lot of you are most probably not even aware of what is a power inverter and how does it work to deliver the power that is needed by the user. In a nutshell, as it has been mentioned in the introduction, it has the main purpose of converting alternating current to direct current, producing the electricity or power that is necessary. Your refrigerator, microwave, oven, and other common household appliances are using a power that is known as alternating current or AC. Meanwhile, the electricity that is produced by your car is direct current or DC. The voltage that is produced by the latter is minimal, and hence, it is insufficient. This is where the functions of a power inverter for car enters the picture. Why You Need a Power Inverter? There are many reasons why a power inverter will prove to be a worthy investment. 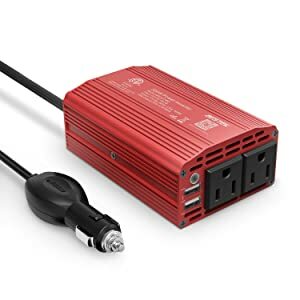 For instance, if you love road trips, tailgating, or camping in your motorhome, among other outdoor activities that involve your vehicle, a power inverter will be handy. This will allow you to use common household appliances while on the road, such as a microwave and water heater. 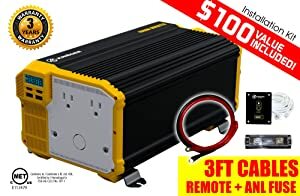 For busy individuals and for those who would like to stay connected, a power inverter is also a must. This will allow you to charge your phone while driving, making sure that you will never run out of battery. The same thing can be said for your laptops. In some cases, people might think of bringing portable generators when they are camping to be provided with the power that they need. Yes, it can provide plenty of power. The problem, however, is that the generator can be noisy. This is another instance wherein a power inverter becomes valuable. It provides power without the noise. To add, you need to have a power inverter if you want to be provided with power without running cost. This is because using a power inverter does not require the need to use diesel or petrol. Power: This is indicative of the performance that you can expect from the power inverter. Look at the watts of the product to determine how powerful it will be. First, you will have to think about the appliances that will be used so that you can determine the wattage that is right for your needs. Outlets: As you try to evaluate the options, you also have to look at how many outlets are present. Most have one or two outlets. For motorhomes, more outlets can prove to be the better choice since this means that you will be able to plug multiple devices or small appliances at once. Materials: You also have to consider the materials that are used and see to it that it can withstand the test of time, especially if you are buying one that is expensive. Especially the cables, they must be made from an excellent material that can offer excellent conductivity. Safety: It is also necessary to take a look at the features that will ensure the safe operation of the power inverter. Most models have built-in protection from overheating or overcurrent production. This will help to prolong the lifespan of the inverter while keeping your gadgets and appliances safe as well. Fan: This is a feature that is not present in all models of power inverters. If there is a fan, you have to make sure that it operates quietly. Otherwise, it will be annoying. A fan is a good add-on feature because of the cooling effect that it provides, and hence, it prevents overheating. Warranty: A lot of the power inverters have a warranty that lasts for a year. The better ones have longer warranty coverage. Within the duration of the warranty, the manufacturer has got the product covered against defects, which is a good thing since it can provide you with peace of mind. The best power inverter for car may seem like a tiny device, but it is big in terms of what it can do. This is an essential investment for car enthusiasts who are always on the road, especially if you have a motorhome. It will provide the electricity that you need for your smartphones and small appliances, among other things.